A few years since I've been to Harrogate. Still haven't managed to get into Betty's Tea Room. One of these years though ! 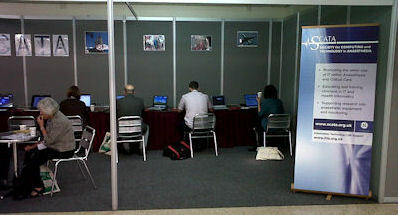 The AAGBI meeting had one of the quietest trade exhibitions that I've seen, but the SCATA Cybercafe was busy as usual. Chris Hopkins and I had a minor panic attack on the Wednesday when our brand spanking new pull-up display stand came apart within an hour of going up. Fortunately we did a DIY job on it and it survived the remaining two days. We experimented with Webalizer to collect some usage stats from the PCs which was a success, but a bit limited in terms of what information it recorded. Next time we're going to push the boat out and set up Squid as a proxy web server so that we can get a better idea of what the overall traffic is like for the three days. Paul gave us a laugh with the Ubuntu "XP skin" which is pretty convincing - you had to look hard to detect the Linux hairy underbelly. I doubt that many users even noticed that they weren't using Windows. The venue's connection was once again tip-top quality: speedy and reliable all three days. The highlight of my trip was an evening visit to the Hydro pool on the road north out of Harrogate. There's a separate diving pool with a 5m platform. Edinburgh's Commonwealth pool has been closed for over year for refurbishment so I enjoyed re-aggravating my old shoulder injury which has been fine since I gave up platform diving. Next Cybercafe will probably be the WSM in London in January.